Our friend, Turns (another Turnbull, no relation) has been asking us when we were going to make Kimchi. He knew that we loved having at least one, if not two, crocks of Sauerkraut fermenting on the kitchen counter…so why not try something different!? That’s right, why not? Well, we couldn’t come up with a good reason NOT to try this…so last night we ‘toasted’ Turns and started a batch. 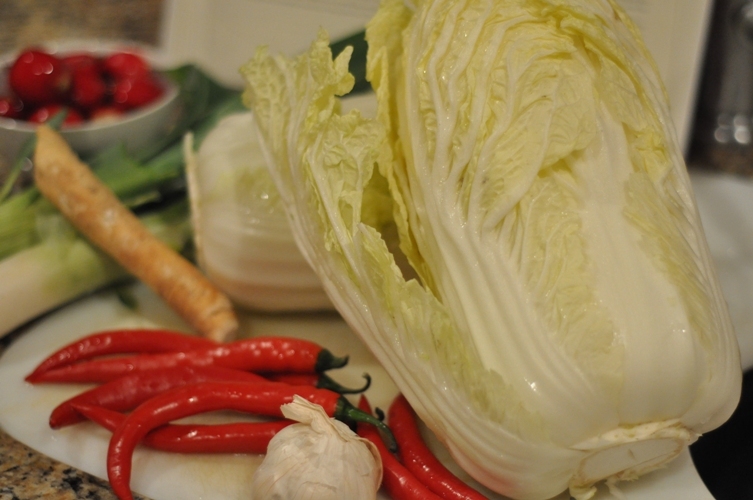 Kimchi, is an extremely popular and culturally important fermented Korean dish. The variations of this traditionally spicy dish are endless depending on vegetable choices, amount of heat, use of fish sauce, and of course, personal taste. But, one thing is agreed…it is part of Korean culture and served with every meal (or, at least, this is what our research indicates). In March of 2010, South Korea opened a state-run Kimchi Research Centre which aims at developing fermentation technologies that will provide scientific data to help introduce the benefits of Kimchi to the global market. There are a number of health benefits derived from eating fermented foods…many more than we ever realized or thought about. We just simply wanted to try making it and then, loved eating it. But, further reading and just simply getting hooked on the stuff has convinced us that it is more than the delicious homemade taste that keeps us refilling the crocks. The whole process of fermentation is amazing…the nutrients are not only preserved but they are also broken down making them easier for us to digest. And, fermented Kimchi may have some of the most beneficial properties. It is made with a number of different vegetables, (usually cabbage, onions, and garlic) that are a rich source of vitamins; plus, a liberal amount of hot peppers, which are also known to have health benefits. 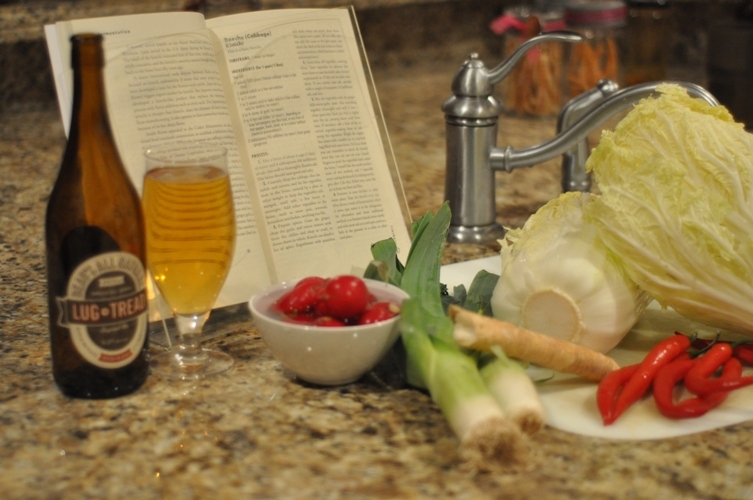 Well, we are simply CANNERS and food lovers we are going to give fermentation two thumbs up! And, if this experiment turns out and we get hooked on Kimchi (like people claim they do after visiting Korea) we’ll give it four thumbs up! RECIPE FOR A BASIC KIMCHI: from Wild Fermentation by Sandor Ellix Katz (this is for a 1 litre or 1 quart jar) but we multiplied ours by 6 because our two napa cabbages weighed 6 pounds…it seems nothing is done in small batches around here. Mix a brine of about 4 cups (1 litre) of water and 4 tablespoons of salt. 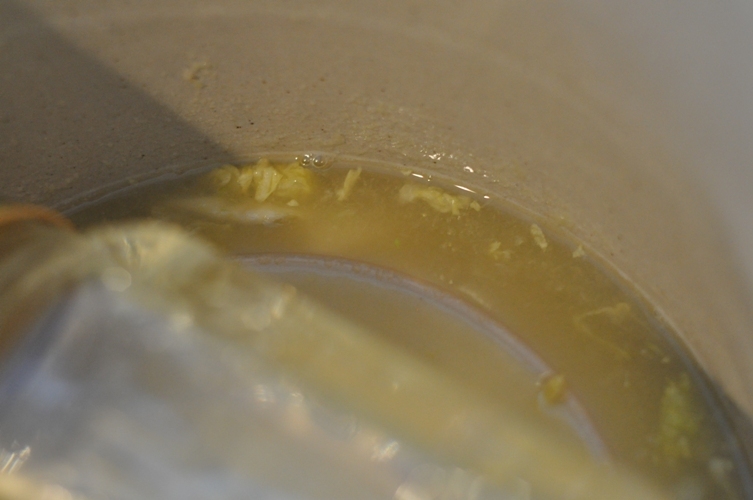 Stir well to thoroughly dissolve salt. The brine should taste good and salty. It is important to point out that you should not use water that is heavily chlorinated because it kills the microorganisms. Water that is chlorinated should be boiled before use to evaporate the chlorine…but, we’d recommend using water from another source. Coarsely chop the cabbage, slice the radish and carrots, and let the vegetables soak in the brine, covered by a plate or other weight to keep the vegetables submerged, until soft, a few hours or overnight. Add other ingredients to the brine, such as snow peas, seaweeds, Jerusalem artichokes, anything you like. 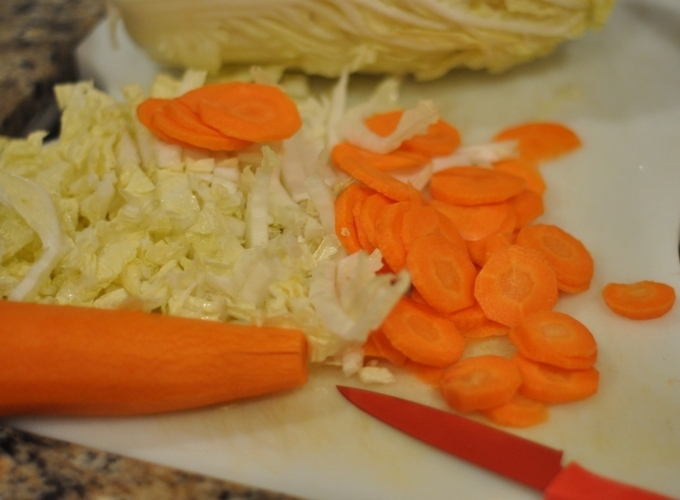 Here we cut the radishes and carrots into rounds but next time we’d slice them into thin strips…it won’t affect the taste but next time, it will look more authentic. We let our veggies soak in the brine overnight…it was too late to finish what we started. See how full the pot is now…check out the difference once the veggies have soaked, been mixed with the paste and repacked…it’s the same crock. Next Day~ Prepare spices: Grate the ginger; chop the garlic and onion; remove seeds from the chilies and chop or crush, or throw them in whole. Kimchi can absorb a lot of spice. Not really sure what “a lot” of spice means…Matt loves things crazy hot but I don’t. So, we deseeded the chilies and left them whole. Experiment with quantities and don’t worry too much about them. Mix spices into a paste. The magic bullet works great for this job! (If you wish, you can add fish sauce to the spice paste. Just check the label to be sure it has no chemical preservatives, which function to inhibit microorganisms) We didn’t have any fish sauce ~ so we will have to add it to the next batch…see, we’re already preparing for the addiction that is going to strike! 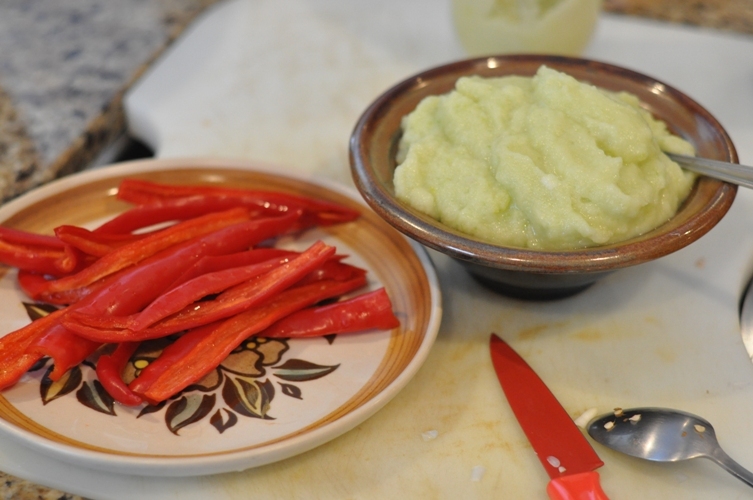 Drain brine off vegetables, reserving brine (you won’t need too much, if any) Taste vegetables for saltiness. You want them to taste decidedly salty, but not unpleasantly so. If they are too salty, rinse them. If you cannot taste salt, sprinkle with a couple of teaspoons salt, and mix. 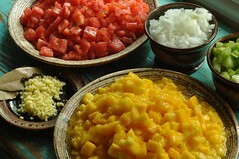 Mix the vegetables with the ginger-chili-onion-garlic paste. Mix together thoroughly and stuff it into a clean 1 litre jar. We packed our Kimchi back into a small 2 gallon crock. Pack it tightly into the jar, pressing down until brine rises. 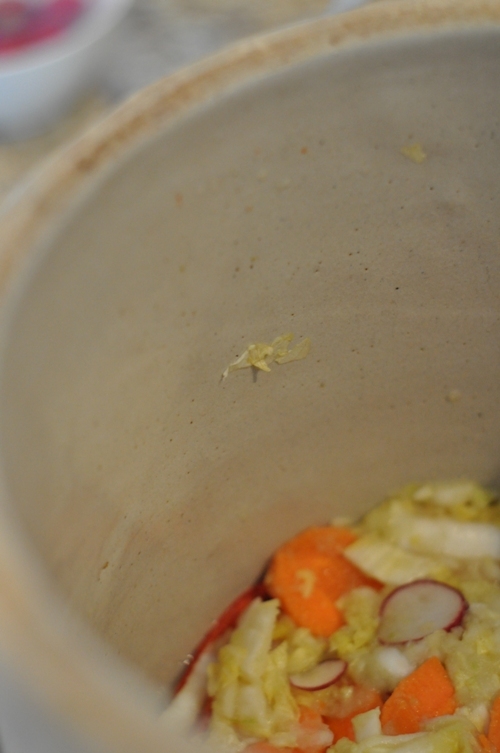 If necessary, add a little of the reserved vegetable-soaking brine to submerge the vegetables. In ours, the brine instantly began to rise and we did not require any additional liquid…but we did reserve some in a 1 litre jar just in case. Weight the vegetables down with a smaller jar and cover the jar to keep out dust and flies. Ferment in your kitchen or other warm place. Taste the kimchi every day. After about a week of fermentation, when it tastes ripe, move it to the refrigerator. An alternative and more traditional method is to ferment kimchi more slowly and with more salt in a cool spot, such as a hole in the ground, or a cellar or other cool place. Further reading suggestions that Kimchi gets better tasting with age (6 months and up) and may last 1 to 2 years. We don’t think this small little bit has any chance of lasting a couple of months…but the whole thing is so interesting. The Kimchi smells so good…hopefully, it will mask the smell of the Sauerkraut (although, the Kraut smell is not too strong…every once it a while, you get a whiff of a smelly cheesy, dirty sock odor…MMMmmm but it tastes so good) Let’s hope the Kimchi isn’t too hot and tastes as good as the Kraut. Fingers crossed! ← Gateau Basque – Eat’n Up Turnbull Style! We’ve made two batches of kimchi so far, and love it! The recipe we use is a little different–we use 1 tablespoon of salt per pound of stuff, and pack everything down into a food-grade bucket; after a few hours, the napa and bok choy release the juices, thus creating enough water to cover everything (and no need for brine). 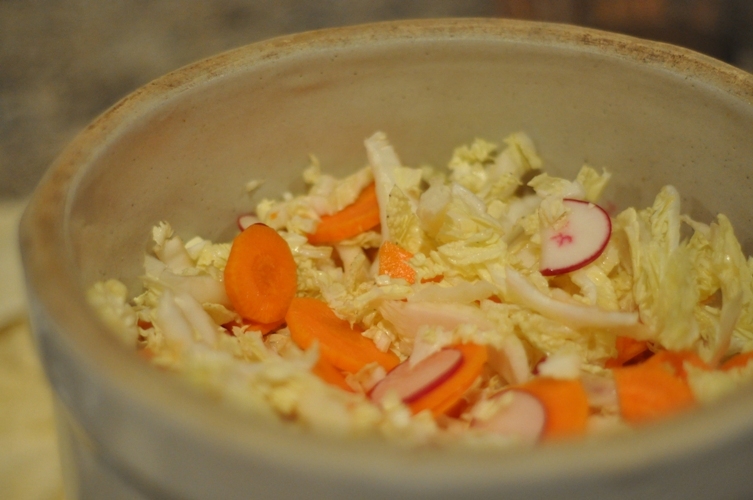 Thus, the process is a little easier, with no water involved, just the natural juices of the cabbage and radish. We’ve also used turnips, and had great results. I, like you, didn’t used to like spicy things, but after trying our first batch of kimchi, I decided that the second batch should be spicier–and it was just fine to my (developing) tastes. Good luck with your fermentation experiments! Looking forward to hearing about how it goes. turns will be so proud! I’ve been wanting to try to make my own kimchi for some time now. I love the stuff! This is a nice recipe! I found that the addition of carrots gave it an interesting and different flavour to normal kimchi. Have you tried adding pear juice? Thanks for your comment. No, we haven’t tried the pear juice…How does that change the flavor? We’ve found carrots to be a great addition to many recipes you wouldn’t expect to find them it…they are also great in salsa!